Love it! I've been eyeing that map bow for a week, trying to decide if I can make time to make all my own Christmas bows this year or if I'm being totally crazy to consider it. Glad to know they don't take long. these are great! 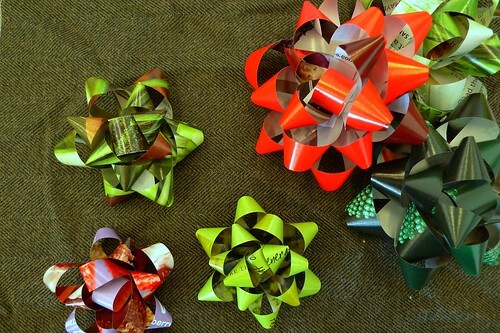 can't wait to start making them (as soon as i buy some scotch tape - yeah, i've been wrapping gifts with packing tape). it might be fun to chop up some holiday catalogs... but i'm pretty sure my bows won't be nearly as lovely as yours. I am now reminded to pick up scotch tape today. Hooray, internets!